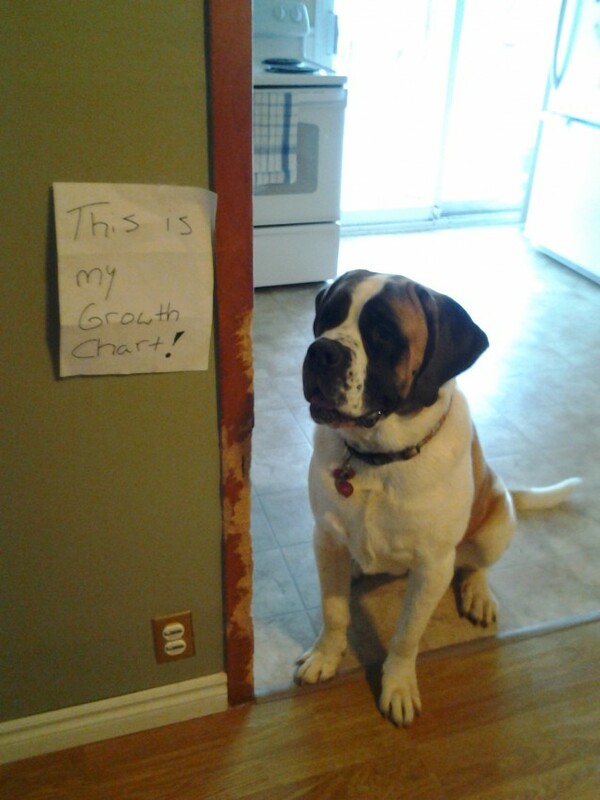 Mylie decided to make herself a growth chart! she’s now two it’s pretty accurate. So funny, good for you for leaving it that way! Thanks for giving me my out loud laugh for the day. Hope you leave always! Such a pretty dog and happy! I love this! It could of been a lot worse. Props for leaving it the way it is! Sasha Bear my saint says if Mylie wants to play she is welcome to come soak in the hot tub wiuth him! This makes me so happy! Much happier than it would make me if it were my dog and my home, probably. What a handsome St. Bernard. I thought this was my dog jungles when I first saw her. Love it ! I sympathize, anonymous Saint Bernard owner. Only, thankfully Doc wasn’t a chewer, so HIS growth was measured by the height of his drool Rorschach paintings.